Den tropiske detektiven (detective novel; Swedish title; Verbal 2018). In the third installment of the Majestic trilogy, "Tropical Detective", our favorite sleuth Hari Majestic has to face the greatest challenges of his detective career so far. While his life is falling apart with the force of a monsoon thunderstorm, he is wrongly accused of taking part in a bank robbery which ultimately leads to him finding out that the end of everything might just be around the corner. Can he save the world and its heritage? It becomes a one-man's-battle against impossible odds. Times of India: “...plot twists and encounters so funny, one has to pause while reading to laugh. Zac’s third book in the Hari Majestic series once again proves how well he understands the Indian reader’s sentiment and he must be credited for tickling their funny bones as well.” Scroll: “As over the top as ever.” Frontline Magazine: “Apart from making a valuable addition to the genre of crime fiction, Zac has also made Bengaluru the centrepiece in his stories. His observations of the city are bang on.” The New Indian Express: “Tropical Detective comes from this special place of love and unabated laughter.” The novel received rave reviews in Swedish media too - too burlesque, too hardboiled and too much fun! A small travel book exploring the history of the once glorious city of Barygaza, which attracted merchants from Greece and Rome, and was once the greatest hub linking east and west. Today the city is called Bharuch and located on the Indian west coast in Gujarat, its history largely forgotten, and going there to find it, turned out to be an interesting adventure. From the reviews: "A fascinating account of Bharuch’s Grecian past and its ghee-rich cuisine (National Geographic Traveller); "As a foreigner who has been living in India for over two decades, he is uniquely placed to look at even the most unremarkable regions with fresh eyes and bring a new perspective" (Mint Lounge). The book has a foreword by one of India's most eminent archaeologists, Professor P. J. Cherian, Director, Pattanam Excavations (2007-2016), specializing on the particular era, and who wrote: "Zac is endlessly curious, uncompromisingly methodical, judiciously critical, infinitely imaginative yet earthly. … This brilliant documentary is the product of exacting hard work." Operation: Operation (detective novel; Swedish title; Ordfront 2015). A sequel to "Mr. Majestic! "/"Operation Sandalwood" underneath: Hari Majestic has this great idea that he will cement his reputation as a hero by starting a detective agency, enlisting all his crazy friends – a video pirate, a cybercafé owner and an auto-rickshaw driver. Their first case, the usual run-of-the-mill investigation of suspected marital infidelity, goes absolutely haywire and as a result, Hari ends up in the biggest mess of his life... A medical thriller, released on April 1, 2015 and the reviews in Swedish newspapers have pronounced that “O’Yeah is, as usual, an entertaining guide who moves around with familiarity in Bangalore’s back alleys as well as in the daily lives of his fictional characters” (UPPSALA NYA TIDNING), “Screamingly funny and familiar fervour” (GÖTEBORGS-POSTEN) and “Funny? More than so: Fully crazy!” (YSTADS ALLEHANDA). The English edition was launched in October 2015 and the reviews are good: “Detective fiction unlike any kind of detective fiction ever written before” (The HINDU), “More than once, the plot will remind one of South Indian as well as Bollywood films” (The PIONEER), “the larger-than-life pep and total unbelievability of a desi crime thriller” (The SUNDAY STANDARD) and “The book is a joy to read, because of O’Yeah’s sparkling prose peppered with wit and dollops of observational humour” (SAKAAL TIMES). Hari Majestic is an unlikely detective: a reformed tout and small-time conman who finds it increasingly difficult to carry on doing his job with a pure mind. The offer to investigate the disappearance of a tourist seems at first like a great career improvement, but it turns out that there's more to the mystery than meets the eye. Soon Hari Majestic begins to doubt his own survival and reincarnation chances. From the reviews: Timout Magazine wrote ”your brain will be sharpened, and your gut ought to enjoy the roller-coaster ride. O’Yeah holds the plot together; his writing completely in tune with Bengaluru's underbelly, it rings with the authentic creak of the cogs on which the city’s miscreants run its machinery. Reading Mr Majestic is the closest you might ever come to downing a quarter of Gagarin of Gokak Falls in the back room of a shady bar in Bengaluru. So do it.” Postnoon said ”If you enjoy psychedelic writing, with lashings of humour and a satisfying whodunnit all rolled in one, yep, this could be the book for you" while The Hindu Literary Review pointed out that "the real fun lies in discovering that Mr. Majestic is an authentic Indian thriller, rather than a Western prototype shoehorned into an Indian setting". The Swedish newspaper Aftonbladet concluded its review of the Swedish edition by proclaiming Operation Sandalwood "a wonderful book", Dala-Demokraten wrote "Perhaps Hari Majestic has an ancestor in Dashiell Hammett's 'Sam Spade' or maybe he is a reincarnation of Raymond Chandler's hardboiled hero 'Philip Marlowe'?" and Corren proclaimed that: "a fresh wind is blowing over the Swedish detective fiction scene", and, yes, of course it was an instant bestseller. The first German review, in the newspaper Die Welt, proclaimed that it is "ein schwarzhumorig kurzweiliges Vergnügen bester Krimiunterhaltung, was nicht zuletzt seiner urkomisch geratenen Hauptfigur und seinem Helden wider Willen zu verdanken ist" (meaning, probably, that it is a "darkly humorous great thriller entertainment, thanks primarily to the hilarious protagonist and reluctant hero".) And the final word was said in the Daily Mail: "Delightful!" /---/ Bonus jackpot: Soon to be made into a major motion picture! ‘The Sum of it All’ is a thriller woven around the warlike state that the world has been in the grips of for almost the entire first decade of this millennium. In it, somewhere in the Middle East, a British correspondent discovers that the military is creating an elaborate bluff around the war which he has been sent to cover, and he has to flee for his life through the desert. Meanwhile a female diplomat has to go into hostile terrain to rescue a Swedish woman, whose husband has been murdered under mysterious circumstances. All clues point towards a scary conclusion: the end of the world is being engineered by a shadowy organization of puppet-masters. From the reviews: Helsingborgs Dagblad wrote ”That the linguistic virtuoso Zac O’Yeah’s authorial career is so all-encompassing and rich that it has space both for heavy duty political analysis, important historical narratives and novels that, in their brilliant silliness, makes one laugh out loud can only give cause for applause”, and Göteborgs-Posten said ”O’Yeah is a writer-phenomena with a rare talent for the most incongruent genres”, while a reviewer in the tabloid Aftonbladet felt that the book resembled Voltaire’s ‘Candide’, and finally, some reviewers were left clueless, as the one in Dagens Nyheter who said ”...I find it hard to say what I have just read. A rather nice feeling of bewilderment, actually..."
Available as "Once Upon a Time in Scandinavistan" in English from Hachette (New Delhi) in 2010 and about to be developed into a movie by Hepp Film Co (Sweden). My commercial breakthrough as a writer came with a crime novel which is set in a somewhat futuristic Europe after it has been colonized by India – its industries bought over by Asian capitalists; its administration, by popular referendum, entrusted to the IAS, the Indian Administrative Service; and Swedish food culture infused with the flavours of curry. It was my first book to sell more than ten thousand copies, was short-listed for the Gothenburg Award, and released as an audio CD box. Till date I’ve received a couple of proposals to turn it into a motion picture, so far resulting in nothing at all, although in 2010 Hepp Film Co has started developing a movie version. Leading daily newspaper Dagens Nyheter wrote: “It is a dizzying satirical carnival of a novel, which most people ought to take the time to read”, and the top-selling tabloid Aftonbladet wrote: “One of the most spaced out books I’ve read in years… a grand venture carried by a never-ending and very original linguistic imagination”, and even the independents were in favour, such as Göteborgs Fria Tidning: “One of the most original crime novels written in Swedish… makes Raymond Chandler’s hardboiled urban landscapes look like fairy tale idylls”. An account of my failed attempts to land a bit part in a Bollywood movie, this small book was published as a paperback by the Gothenburg Film Festival. It also is an introduction for Swedish film buffs to Indian cinema beyond Mumbai talkies. The venerable cultural journal BLM wrote that “the sympathetically loose format lets O’Yeah freak out in hysterically funny digressions in superb Gonzo style – and at the same time throw in small pedagogical fact files alongside”. A small book of essays on Indian culture, ranging from astrology to food, combined with an almanac of Indian holidays and other auspicious dates of the year. A kind of thriller or horror novel, this was my first experiment with e-books, and the story is a rather gruesome one about a journalist who gets almost massacred. When he wakes up he’s in a bizarre mental asylum – in a stranger’s body. His quest to find his true identity becomes a nightmarish journey through a town where a mysterious serial killer seems to be stalking him. Don’t read it unless you like very spaced out stuff. ”USA - personlig handbok för alla som reser” (USA - a personal guide for every traveller, travelogue 1998) Reissued as an e-book in 2010! The result of a couple of trips to the US, this book essentially describes how to tour the country from coast to coast, via the South and up through the north, and see as much as possible of American culture – as in where exactly the Paul Auster film ‘Smoke’ was shot and on which heritage monument Ozzy Osborne urinated. Without spending too much money, which is a great concern for any poor author. Although again I had a modest stipend. The book was a hit with reviewers who wrote things like “It’s fortunate that Zac travels so much when I don’t have the time to” (Damernas värld) and “I’ve never read anything like this” (Bärgslagsbladet). They sound a bit jealous, don’t they? My debut novel – about a depressed young man who gets mixed up with a murderer – was a dark and brooding sort of thing, which took many critics by surprise: especially those who had enjoyed my first travelogue. “The melancholic but very impressive Pajazzo is a short and psychologically penetrating novel… a story with unexpected depth of soul. Pajazzo is a deceptive novel, to such an extent that it demands a second reading which is very rewarding.” (Göteborgs-Posten) Yes, I did a few public readings and pulled in audiences numbering around… two people. This is my first book, which turned out to be quite popular among Swedish backpackers – especially those who wanted to have cultural experiences in India (and Nepal, which is also covered in the book). The reviewers were very friendly and wrote things like “Without doubt the best guide to this country ever published in Sweden… To read it is pure pleasure and also a thrilling adventure” (Sydsvenskan) and “This is an impressive all-in-one-book, travelogue, handbook and cultural introduction at the same time” (Vi). By and large the book was a result of some two years on the road, 1992-1994, with a typewriter in my backpack and a modest stipend from the Swedish Artists’ Fund. Yes, those were the days when people still used typewriters. The book is completely sold out and nowadays hard to get, but used copies can occasionally still be found in second-hand bookshops in Delhi or Calcutta. And then, what happened before all this? Previously the writer (here centre of picture) used to work in a pop group, The Butterfly Effect a.k.a. Twice A Man off-shoot, Circa 1990. 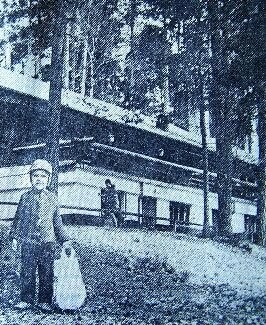 First known press photo of the author in the Finnish daily newspaper Aamu-lehti, Circa 1970. The links for each title will lead to more information on each book, although the information will of course be in Swedish. Plans are afoot to upload excerpts in English from some of the books.